It's been three years since Miles fell for Vivian, a talented and dazzling transgender girl. Eighteen months since a suicide attempt left Vivian on life support. Now Miles isn't sure who he is without her, but knows it’s time to figure out how to say goodbye. He books a solo trip to Iceland but then has a hard time leaving the refuge of his hotel room. After a little push from Oskar, a local who is equal parts endearing and aloof, Miles decides to honor Vivian's life by photographing her treasured Doc Martens standing empty against the surreal landscapes. With each step he takes, Miles finds his heart healing--even as he must accept that Vivian, still in a coma, will never recover. Told through a series of instant messages to Vivian, this quirky and completely fresh novel explores love, loss, and the drastic distances we sometimes have to travel in order to move on. Grief is a funny thing, it's usually messy--and rarely neat--with the barest of touches, it makes a wreck of your life. 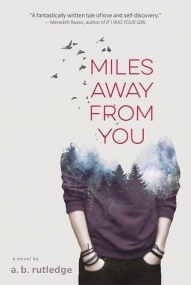 Miles Away From You is a wreck of a novel, in that it totally encapsulates grief, it's effects--and what it's like to, try to move on. Miles' girlfriend is in a coma, and everything outside of her seems wrong. The art website and magazine they've worked on together--seems like a space that will never be filled again. Everything is just off, and Miles is barely dealing with it. As a result, his Mom's send him off to Iceland. For a month. In Iceland, he meets people, learns things--and eventually learns how to move forward. While the book is heavy on the grief, it doesn't feel too bogged down by Vivian's comatose state. It allows for character growth--and story progression, never allowing the story to stay in one place for too long--which can happen when one of the main characters die, or start the story off dead--or even near death. This book, while not necessarily for everyone, will appeal to a general audience--particularly if you've lost someone before. There are solid characters, misadventures, and picturesque moments that will appeal to many a reader. Miles will regale you with his awkwardness, and the changes that slowly take place throughout the story. A great story for teenagers and adults alike, the overall message of hope will give the reader something to root for, and maybe even a romance to swoon over.